Simon Stephen's dark, zany adaptation of one of Brecht's best loved works is brought to life by an impressive company of actors in Rufus Norris' new production of The Threepenny Opera. The production is heavily influenced by typical Epic Theatre conventions, which naturally complements the text and facilitates many of the play's comedic moments. Not only this, but this production's promise of 'filthy language and immoral behaviour' is fulfilled tenfold. A sunken-eyed Rory Kinnear is deliciously unnerving as gang leader Captain Macheath, the play's imposing antagonist. Sporting a pencil moustache and a sleek double breasted blazer, he walks a fine line between sleazy and suave, although at times this sleaziness undercuts the character's quiet ferocity. Meanwhile, Nick Holder is striking as Peachum, Macheath's enemy and the conniving controller of London's beggars. However, it is Rosalie Craig as Polly Peachum, Macheath's affable and sharp witted young bride, who dominates every scene. Her portrayal of Polly's growth is enthralling and she brings a new dynamic to many of the play's notable songs and scenes. 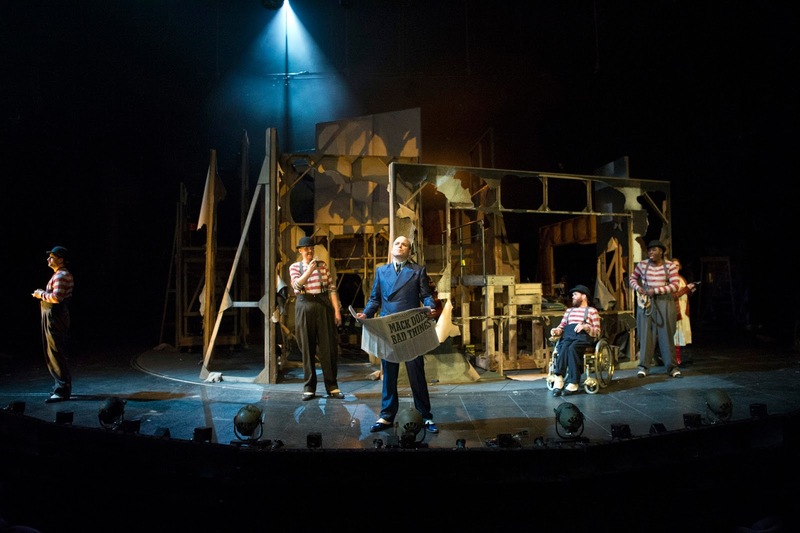 Although The Threepenny Opera is typically a small, intimately staged play, this production works remarkably well on the Olivier Theatre stage. In fact, the large stage opens the door to a number of innovative yet ludicrous set pieces, which are used ingeniously throughout, and yet compliment the deliberately bare bones aesthetic of the production; however, Paule Constable's lighting design helps to create a sense of intimacy on stage, when the plot calls for it. 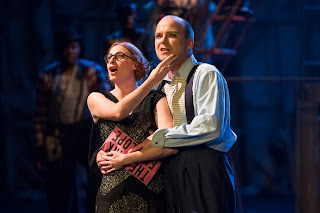 Despite being rather absurd in both plot and design, an air of chilling unease punctuates The Threepenny Opera's more sobering moments. Nowhere is this more noticeable than when Sharon Small's Jenny Diver, a prostitute addict and one of Macheath's many ex-lovers, takes centre stage to sing Surabaya Johnny, a powerful lamentation interspersed with moments of uncomfortable fragility. Small's haunting vocals and pained expressions make this rare grounded moment perfectly and unbearably uncomfortable. In this moment, as well as several others, the juxtaposition between Simon Stephens' blunt and abrupt translation of Brecht's dialogue and Kurt Weill's stirring and dramatic music is particularly apparent. From the characterisation to the costume design, everything about this production of The Threepenny Opera is gloriously grotesque and thoroughly entertaining from start to finish. The offbeat and often shocking content may at times be a little overbearing, but there is much to enjoy in this production, as both a spectacle and a compelling piece of theatre. The Threepenny Opera is running until October 1st at the National Theatre, London. Visit the theatre website here for more information and to buy tickets!